If among the represented cities there is no Contact Us and we will definitely expand the geography of our services. There are only a few days left before the New Year and it is important to know every detail of its symbol - the Monkey, in order to provide itself with luck and well-being for a whole year. It's not for nothing that they say that if you cajole the sign, you will be accompanied by success and happiness throughout the following year. The element of 2016 is fire, according to this basic characteristics of the coming year are dynamism, brightness, energy, aspiration. According to astrologers, 2016 will be quite successful and incredibly interesting for all signs of the zodiac. The main thing is not to miss your luck! The Fiery Monkey will give everyone a chance to change their lives for the better. How to decorate a house? On the windowsills, festive table, you can arrange various figures of monkeys, made of wood, crystal or bronze. Porcelain or plastic figurine can be hung over the front door. To decorate the tree, too, you need to come up creatively. In addition to large multi-colored balls mainly golden, red, yellow, orange, you can hang bells, bows, snowflakes, candies in brilliant wrappers. And of course, without a garland, beautiful New Year's beads or rain here is indispensable! They are very fond of a monkey. Also, if you have an artificial Christmas tree in your house, you should definitely hang some branches of fresh needles in the house, which is a symbol of prosperity. It is important to remember that the element of this symbol is fire, so everything should shine in the house: a garland, New Year's lights, candles on a festive table. What to celebrate the New Year? Fiery Monkey adherent all bright and shiny, so you need to focus on red, yellow, orange, coral, gold, pearl, mustard, as well as chocolate colors. Do not be afraid to be very bright! Bright colors, fancy dresses, sequins, massive shiny decoration - this is exactly what you need. Your appearance must be perfect. If you are a classic style lover in clothes, use shiny jewelry. Just do not forget to add your image in the form of a variety of accessories. For example, unusual clutches for girls, stylish butterflies for men. It is important to note that it is not at all necessary to furnish the table with all completeness and pomposity. The main thing for this symbol of the new year is to create a joyful atmosphere, but do not forget about comfort and comfort for you and every guest. You can decorate with colorful ribbons cutlery, tie cute bows and attach them to the tablecloth, place on the table candles. 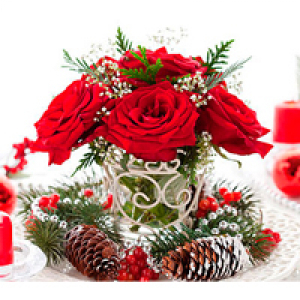 So your table will seem more festive and New Year's. The mistress of the year 2016 is a lover of fruit, so you need to focus on tropical dishes. All sorts of fruit salads, fruit skewers, fruit snacks will be a wonderful and tasty addition to the rest of your dishes. You can also beautifully and brightly decorate other salads with the help of grains of pomegranate or pineapple rings. As for alcohol, then choose noble drinks: whiskey, expensive cognac, sparkling wine. From nonalcoholic you can prefer juice, mors, milkshakes. The main question of each of us is "What to give to your family and friends?" A beautiful gift can be a beautiful bouquet of red, yellow, orange roses. After all, these are the predominant colors of the Fiery Monkey. Especially interesting and festive will be the mixes of these colors. Such a gift will not only express your love and warm attitude instead of a thousand words, but will also become a wonderful and bright addition to the image of your second half.